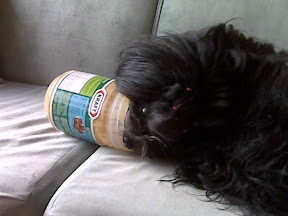 It's always a fun time at this house when the jar of peanut butter is empty because it isn't ever really empty until someone licks it all clean! Normally Josie's gets first crack the empty jar but with Caillee being pregnant, it just seem fitting she should get first crack at it. She didn't share not once with Josie, the little piggy. At one point I was sitting beside Caillee and she was using my leg as leverage to hold the jar steady. She got so far in the jar her head got a tad stuck. It was funny. I pulled the jar off with ease. Eventually I had to take the jar away.